Seasoned with spices and oozing flavors unique to Korea, Chicken Up serves a selection of dishes with fried chicken as its specialty menu item. Tender pieces of chicken are twice-fried to ensure excess fat from the meat is removed, creating crispy-on-the-outside-juice-on-the-inside meaty masterpiece. This main attraction is accompanied by a variety of sauces from sweet to spicy and pairs well with the restaurant's other offerings such as side orders of fries, noodles and claypot soup dishes. Wash down other Korean -inspired staples like bulgogi, kimchi fries, best paired with signature drinks like soju cocktails. Chicken Up has been hailed as The Best Korean Fried Chicken in Singapore by SPH Razor TV in a blind-test conducted alongside with 7 other fried chicken brands. 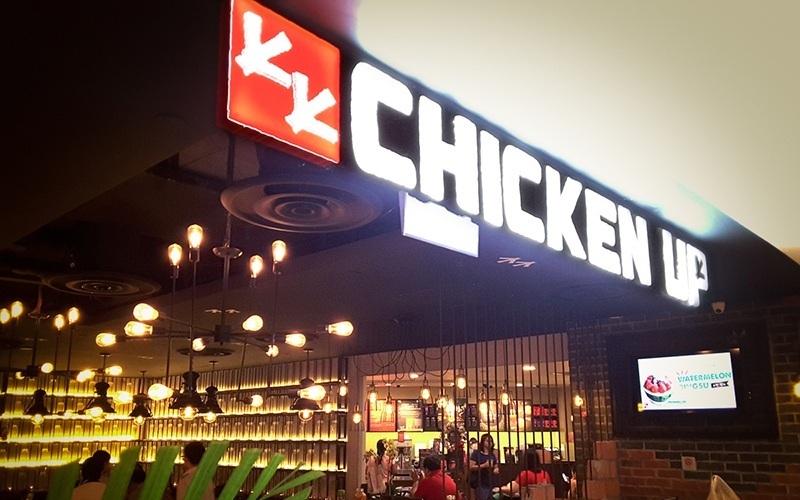 Those craving for Korean chicks may hunt them down at any Chicken Up Branches island-wide, such as Tanjong Pagar, Tampines, Jurong East, Parkway Parade, Centerpoint, Buangkok, and Star Vista.